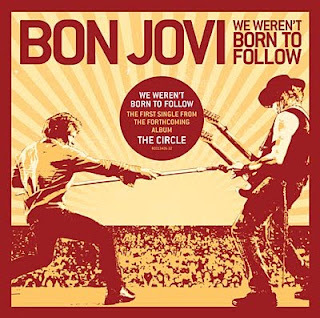 For anyone who couldn't listen to the new single yesterday and still hasn't had the chance to, it's now streaming on the blog section of the official Bon Jovi site. I actually thought the press release was hysterical. I giggled at the "pinky solo" and guitarist/womanizer comments. Too clever. I noticed over there that some people need to buy a sense of humor :) Kinda like on Backstage, but the guy who wrote the press release probably won't get banned. Yeah, that is a solid mock press release. Every new album they claim to be their best. This single, while decent, isn't anything much to get excited about. O + yeah - what is the point of yelling 'Guitar' if your not actually going to have a guitar solo?